Photo: The view from part way up Tyee Mountain across the Entiat River Valley toward Angle Peak. 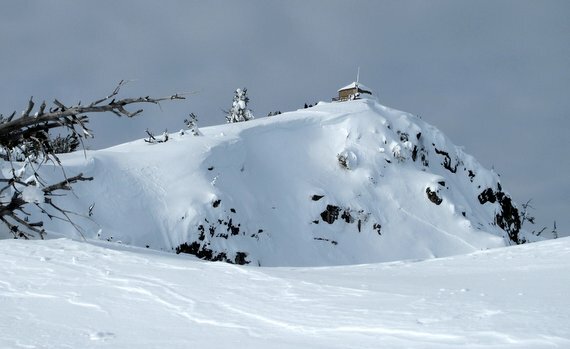 Tyee Mountain is better known as a firefighter’s mountain than a skier’s mountain. Twice in recent history it has erupted in flames, once in 1970 when 100,000 acres burned in the Entiat Valley and again in 1994 when the Tyee Creek fire spread over 135,000 acres. 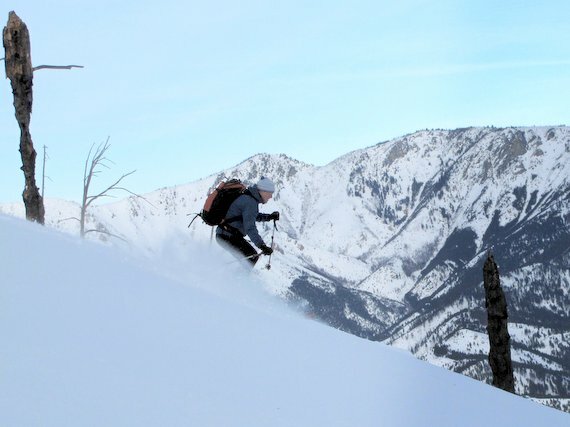 All that burning hasn’t exactly made Tyee a sight for sore eyes, but between the Entiat River (elevation 1,600 feet) and the summit (6,654 feet), fires have opened up a lot of steep, north-facing ground for powder skiing. This combination of ash and stash, of powder and nice, are intriguing, but it’s a trip that’s best taken with someone who can interpret the mountain’s ecology and fire history. 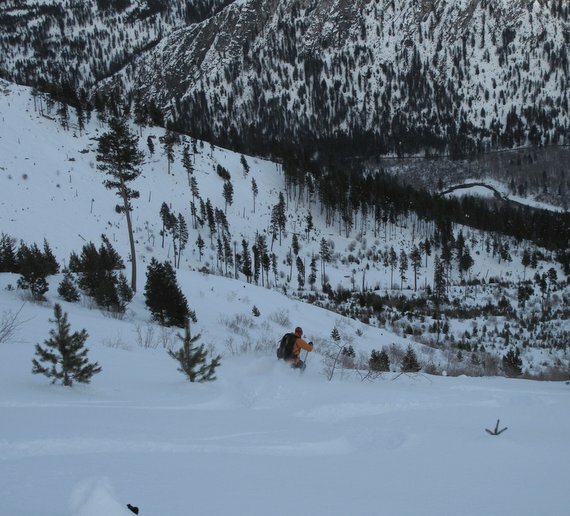 That’s why Tom Janisch and I put the head clamp on Matt Dahlgreen, an enthusiastic backcountry skier and a forester who worked in the Entiat Valley for years. We suggest to him — ever so politely — that if he values his fingers he’ll give us a little schoolen’ while we ski. Matt accepts and takes on his role as educator with gusto. Right off the valley floor, as we move through stands of old Douglas firs and ponderosa pines that are being inundated by young firs, he tells us fire once burned through such stands on 20 to 30-year intervals. These more frequent fires would torch the small trees of the understory. 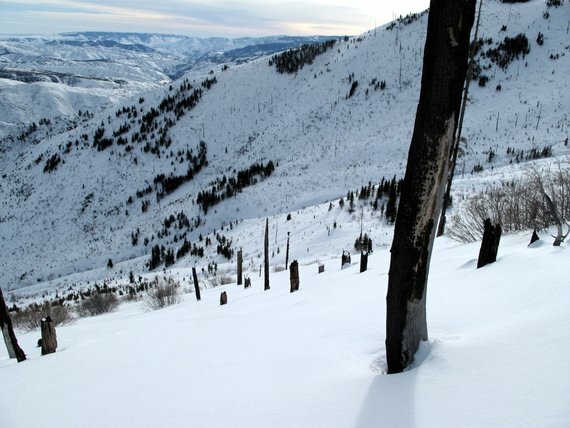 Fire suppression over the past century changed the recipe and allowed fuel – like these trees — to accumulate to the point where flames ignited by lightning or by human carelessness might claim more than the understory. They might jump into the canopy and destroy many of the old-growth trees on the mountain. That lesson has been learned and now prescribed burning and mechanical cutting (chainsaw work) are trying to treat thickets like this one before the understory gets out of hand. Unfortunately, public fear of escaped prescribed burns, public dislike of smoke, and funding shortfalls all make it impossible for land agencies to keep pace with the unrelenting rate of tree growth. Nature wants to fill the void of open ground. “In a few years, if the weather is right, this stand will be ripe to go big when it catches fire again,” Matt tells us as we hack through a jungle of oversized Christmas trees. Photo: Charred snags, remnants of the Tyee Creek Fire, as seen halfway up Tyee Mountain’s East Ridge. Tom and I don’t understand exactly what that loss means to Matt but we have our own gauge — old-growth ponderosa and Douglas fir forest provide fabulous tree skiing while lodgepole stands are usually an unskiable mass of dense and fallen trees. 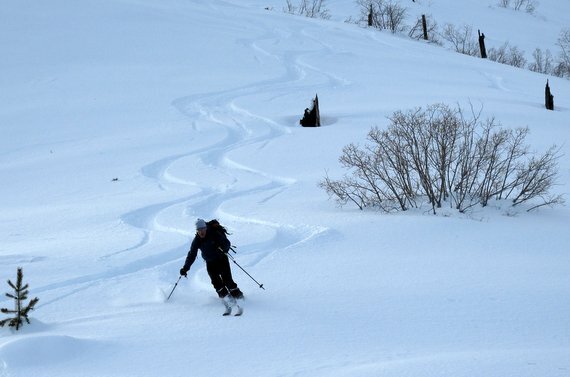 We worry for future skiers. Photo: Touring through dead snags of whitebark pine. Were they killed by blister rust, fire, or both? Hours later we near the summit and move into the cold, inhospitable alpine zone where whitebark pines are one of the few and the proud strong enough to thrive… except that two-thirds of these arboreal tough guys are not thriving. Instead, we slice an uptrack below the canopies of sprawling gray snags. “Blister rust,” Matt says when we ask him what sad fate befell these beauties. Irony. 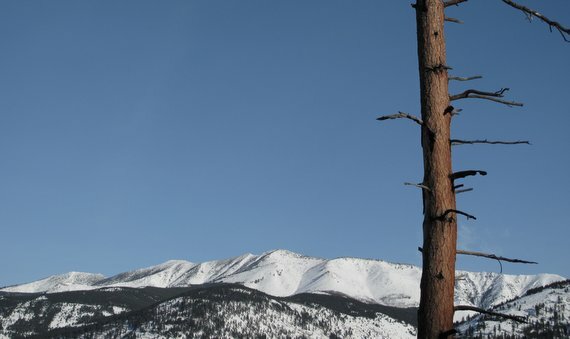 How is it that a peak with a fire lookout on its summit has burned a few times? From the top of Tyee Mountain the view is at once beautiful, ugly, humiliating, and instructive. We can see the rugged, rocky Stuart Range; the rounded snow-coated foothills of the Entiat Valley; and the conical Fujiesque summit of Pyramid Peak. And yet on tens of thousands of acres surrounding us we see the black snags, salvage-logging scars, and the devastation wrought by wildfires. These are partially the fruits of human tampering – of omitting flames from a landscape formerly stewarded by fire, and of too much fuel created by the untreated slash and the overly dense second growth resulting from logging. 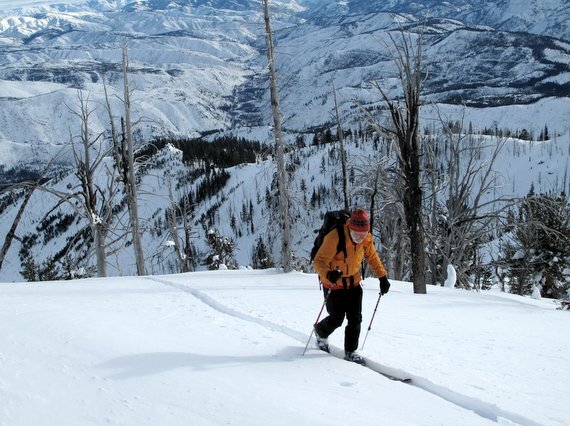 At the Tyee Mountain Lookout we strip skins, tighten boots, and clamp down bindings for the descent. Matt is a bit discouraged. His knee hurts, his tendons aches, and his professional psyche is bruised from all the trees that survived his wrath. 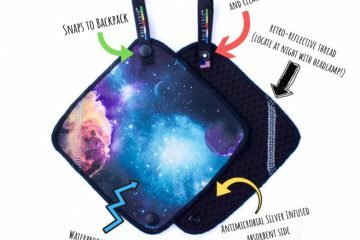 Gravity, however, can hold curative powers. Photos below: The curative powers of fire and fluff. Photos: One good turn deserves… another. The last 1,000 vertical feet of the descent becomes a game of hunt-and-peck. We find islands of big trees offering a few uninterrupted turns but each ends in thickets of young trees. Here we make descending traverses through wooden claws and fingers. 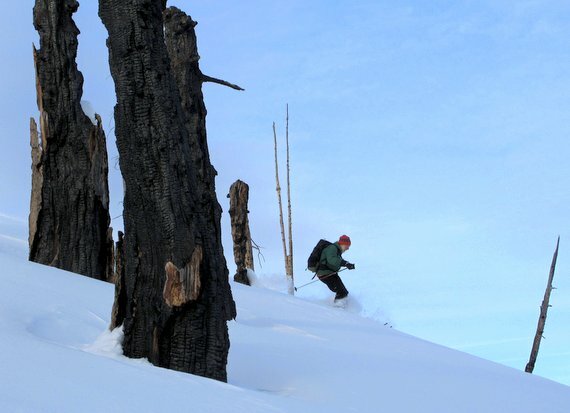 “A good skiing forest is a healthy forest,” is Matt’s mantra as he discusses the fire he would like to rain down on the young trees impeding progress. Photo: Between heaven and earth. A long way from the top … with a long way to go. We hit the lowest slopes where Matt lectured us earlier about young trees creating thickets that would soon endanger the old trees. He doesn’t need to say it — Tom and I recognize that using fire as a tool and interlinked turns as a yardstick would restore the health of this stand. Photo: Tyee Mountain as seen from Preston Creek with the East Ridge marked. Access. From Highway 97-A near the town of Entiat, turn onto the Entiat River Road and drive up river. About 0.75 miles beyond the tiny settlement of Brief, park on the right side of the road at approximately milepost 22.5. The county plows a small parking area at the base of the Preston Creek Road (Forest Road 5501). No permit is required to park here. Elevation 1,770’. Crossing the Entiat River. Getting across the Entiat River whether by wading or paddling is the first order of business. River water levels in winter are usually easy to contend with but snow can make it hard to reach, get into, or get out of the river. A canoe or fishing waders are the best options. Waypoints for three places where Forest Service property allow public access to the river bank are noted on the map (RC1, RC2, RC3). Our map shows private property boundaries along the river to indicate where to cross legally. Map. 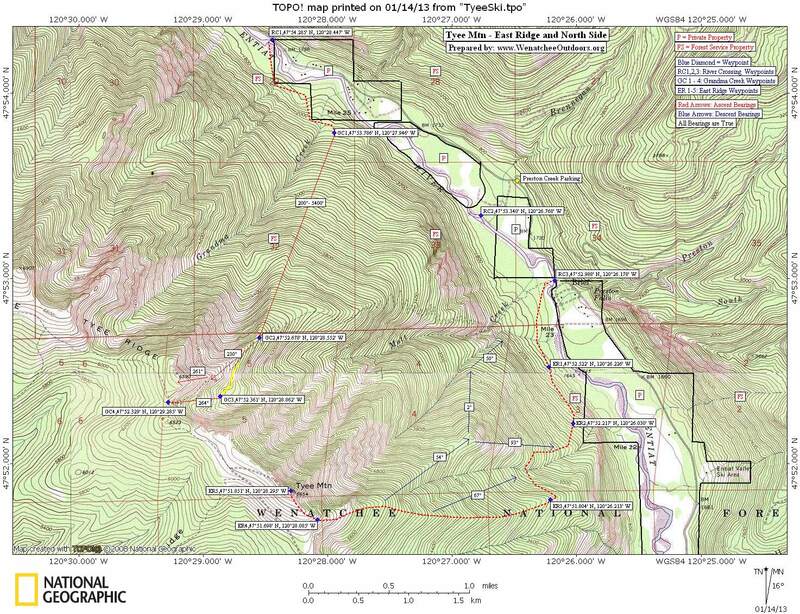 See our topo map of the area below. Park at the plowed parking at the base of Preston Creek Road and walk the road about 0.4 miles to waypoint RC3 and cross river. See map. The next mile is likely to be the worst travel due to thick vegetation — hang in there, the majority of the day will justify the unpleasant start. Generally follow the river’s course south following the most open leads. We headed south but gradually climbed up to 1,800 feet on a contour to waypoint ER1 and then carried on using a climbing contour toward waypoint ER2 at 2,200 feet. Travel may have been easier if we had followed the flatter ground closer to the river farther south and then climbed more directly toward waypoint ER2. From waypoint ER2, climb uphill through increasingly more pleasant forest using a ridge system flanking a rather slotted creek drainage. Climb almost due west up to 3,200-3,300 feet. Contour across the creek’s drainage and make a climbing contour in a southeast direction to reach East Ridge at the 3,400 to 3,600 foot level near waypoint ER3. Head west on the East Ridge up to 6,200 feet and then northwest to the summit (6,654 feet) with its fire lookout station on the top. (Note: the fire lookout will be locked-up tight). Descent. Generally retrace the climb. Or, at the 5,400 foot level of the descent take the northeast trending ridge system noted on the map down to a prominent bench at 4,140 feet. Now take either of the descent arrows noted on the map. 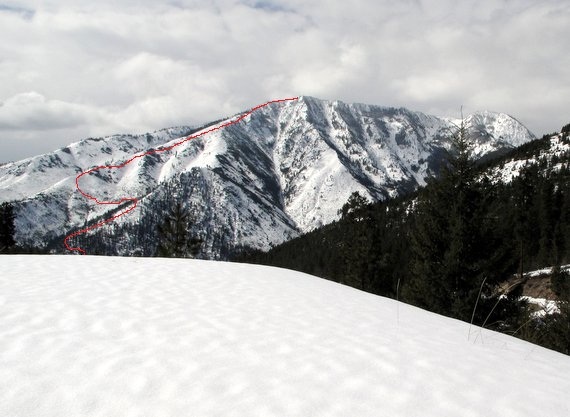 If you follow the north-trending bearings leading toward Mott Creek, be forewarned that the terrain between 2,200 and 2,000 feet gets craggy and may have cliff bands — we can’t say for sure that there’s a good ski line through here. Hazards. 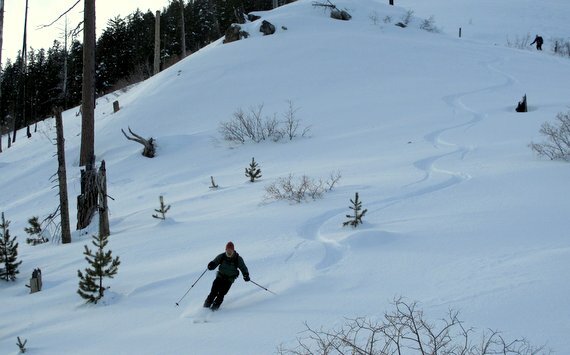 Avalanches can sweep across some of the slopes you’ll contour. 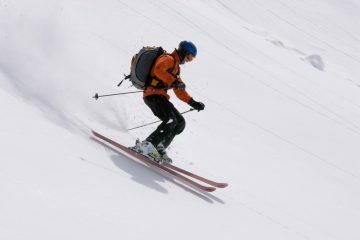 This isn’t a good route when avalanche hazard is high and a few sections of the route are worrisome in periods when the hazard is considerable.